On-Site Photoboards. // Bespoke, weatherproof and durable. Our On-Site Photoboards meet the sample and core logging requirements of the most demanding projects - no matter the weather and whatever the on-site conditions. Our bespoke, durable and aesthetically pleasing On-Site Photoboards not only cover all labelling bases for photographing core and soil samples, but look great in doing so. All of our Photoboards include graduated 10mm scales, clearly legible markers, labels and colour reference charts – fulfilling all requirements for reference boards for exploratory hole documentation. How our On-Site Photoboards can help you. A growing number of geotechnical projects require a clearly legible reference board identifying the project title, exploratory hole number, date and depth of drill runs to be included in each photograph of samples, trial pits and coreboxes. We have the solution to meet this demand. 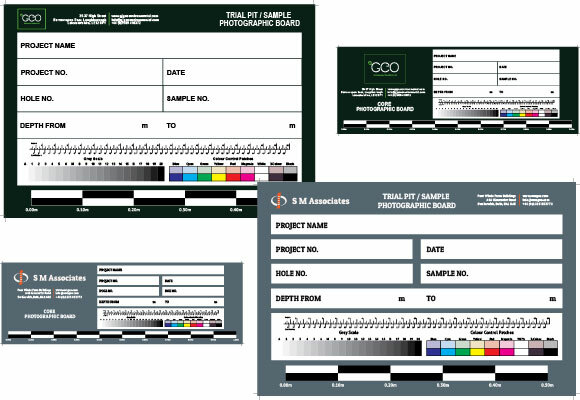 Bespoke, company branded on-site photographic core and sample logging boards designed in-house by Equipe's graphic design team. We can work with you to create the perfect photographic boards according to your individual specification. Clear and concise labelling including: Project Name, Project Number, Hole Number, Box/Sample Number, Depth From and To, and Date.